MINI is celebrating fifty years and is having a party at its own Hatch Race Track for the MINI Cooper S, first presented in 1963. This weekend, MINI is celebrating the fiftieth anniversary of the Cooper S at the race track that saw the car's first race win in 1963, Brands Hatch Formula 1 raceway. Numerous races and heats for the British MINI Challenge are being held this weekend as the iconic British brand celebrates its past and looks towards the future. From its first win in 1963, the MINI Cooper S kept going, winning race after race, including the Monte Carlo Rally in 1964, 1965, and 1967. The MINI Cooper S was a design collaboration between Alec Issigonis, creator of the MINI brand, and sports car designer John Cooper. The car was first introduced in 1959, but did not become a race phenomenon until four years later. 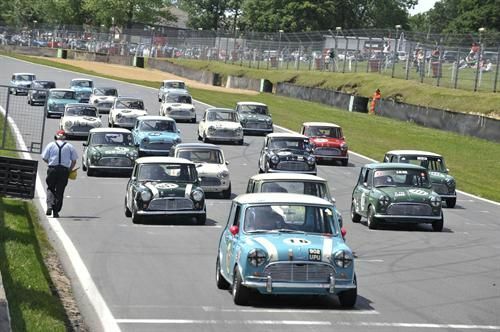 To find the sportiest MINI of the past fifty years, a handicapped race will finish off the celebrations at Brands Hatch, with one MINI Cooper from each model year (fifty in all) competing to take the title. One of those is the original Monte Carlo winner from 1964 and another is the MINI ALL4 Racing which won the Dakar Rally this past year. From its first presentation in 1959, the Mini's compact dimensions, low weight, novel configuration of engine, gearbox and drive and progressive suspension technology gave it an astoundingly agile driving response. John Cooper realised early on that there was sporting talent to be tapped into here, and it was at his initiative that a version named Mini Cooper went on the market just two years after the revolutionary little car's original premiere - with its output now increased to 55 bhp. Since the response to this power enhancement can only be described as euphoric, Issigonis and Cooper got together to prepare for the next level: the Mini Cooper S was born another two years later.